Janet Adams McPherson 63OX 66N, who celebrated her 50th Oxford College reunion last year, retired from nursing in 1995. She enjoys travel, geneology, and her five grandchildren. Janet and her husband, Pat, live in Marietta, Ga.
Penny Smith 63OX 66N and her husband, Tommy, have two daughters and five grandchildren. She retired in 2002 when her husband retired from Georgia Power. They live in Suches, Ga., near the mountains and also spend time at the beach on Pawley's Island, S.C.
Dr. Janet Pitts Beckmann 69MN received an honorary degree in May 2013 from Macalester College in recognition of her professional accomplishments and philanthropic activities. Now retired, Beckmann served as dean of the University of Alabama–Huntsville School of Nursing and as a consultant on health care quality. She is the author of two books on nursing malpractice. Kathryn Grey Gatins 72MN retired on Dec. 31, 2012. Dr. Linda A. McGehee 78N 82MN was promoted to associate vice president of programs with the CDC Foundation, where she leads the program department's daily operations. After joining the foundation in 2007, she managed an initiative to strengthen disease surveillance and response, laboratory capacity, and epidemiologic training in Central Africa. She also forged an agreement to develop public-private partnerships funded by the President's Emergency Plan for AIDS Relief, with projects in Kenya, Tanzania, and Nigeria. She holds a PhD in community health nursing from Georgia State University. Dr. Anne Turner-Henson 73OX 79MN received the Leadership in Research Award during the 2014 annual conference of the Southern Nursing Research Society in San Antonio, Texas. The award recognizes a society member for outstanding merit in leadership, contributions to society, and the promotion of nursing and health care research. Turner-Henson serves as professor and director of Leadership and Education in Child Health Nursing at the University of Alabama at Birmingham School of Nursing. Marilyn Margolis 89MN received the 2013 Lifetime Heroic Achievement Award from the Georgia Hospital Association. Margolis, chief nursing officer and vice president of patient services and operations at Emory Johns Creek Hospital, has been a health care leader at Emory for 30-plus years. Dr. Maria Hanik 94MN is a nurse practitioner in the leukemia and bone marrow transplant unit at Northside Hospital in Atlanta. She completed her DNP at the University of Alabama in August 2013. Nancy Curdy 96MN is director of patient safety, reliability, and infection prevention at DeKalb Medical Center in Decatur, Ga. She helped design her newly dedicated position. "I'm very excited about the commitment our system has made toward patient safety and am honored to fill this role," Curdy writes. She is completing her master's in health care quality and patient safety at Northwestern University. Elizabeth Spatola Stiltner 96N was named a Great 100 Nurse of North Carolina for 2013 for outstanding contributions to the field. Joanne McDougal Patterson 04MN is director of nursing informatics at St. Francis Hospital in Columbus, Ga. She oversees the integration of information technology and the operational support of clinical information systems in nursing. She is working on her DNP at Brandman University. BORN: To Rachel Weinberg 04N and her husband, Brent, a daughter, Grace Marie, on April 22, 2013. Their first child, Grace, was born in Brussels, Belgium, where the couple lived for three years. They now live in Atlanta. 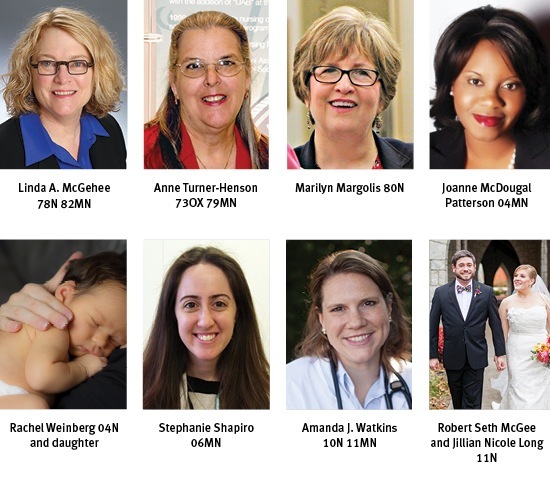 Stephanie Shapiro 06N is an adult nurse practitioner with an internal medicine office in Newtown, Pa.
Sonya Datta-Sandhu 10N 11MN of Kalamazoo, Mich., is a certified nurse-midwife at the Family Health Center of Battle Creek. Amanda J. Watkins 10N 11MN is a family nurse practitioner with Apex Family Medicine, part of Wake Health Services, in Apex, N.C.
Amber Berry 11N 13MN is the only APRN with the Yale-New Haven Hospital Heart and Vascular Center, where she provides outpatient care for women and treats hospital patients. "I credit my graduate training at Emory for preparing me well for this dream job," she writes. "Through my inpatient internal medicine rotation at Emory University Hospital with Julie Schneider 08MN and my summer 2013 rotation with Christine Nell-Dybdahl, Claire Rice, and Laurence Sperling in the Center for Heart Disease Prevention at Emory, I feel confident that I will rise to the challenge of such a complex and fascinating field. And of course, I could not have done anything without Darla Ura (associate clinical professor)!" MARRIED: Jillian Nicole Long 11N and Robert Seth McGee on Nov. 9, 2013, in Snellville, Ga. Jillian is an RN at Emory University Hospital Midtown, and Rob is an RN at Northside Hospital. They live in Marietta, Ga. Crystal Bailey 06N 07MN is serving in Malawi with the Global Health Service Partnership, a new collaboration of SEED Global Health and the Peace Corps. The program sends doctors and nurses to resource-limited countries to address gaps in nursing and medical education. Crystal is a volunteer faculty member at Kamuzu College of Nursing, which trains up to 200 nurse midwives a year. Crystal's days are filled with joy and sorrow in a country where mothers and babies die too frequently. "My heart is for the individual women's experiences, and yet my goal here is for the safe training of the masses of midwives," she writes in her blog at midwifemanna.com. 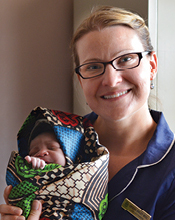 "Malawi is focusing hard on safe motherhood and making gains. For every discouraging thing I see, I also see something encouraging." The Global Health Service Partnership was launched last August at the Malawi state house in Lilongwe with President Joyce Banda in attendance. Crystal says it is a great and challenging experience and encourages other nursing alums to check it out. Loan repayment is also a perk, she points out.